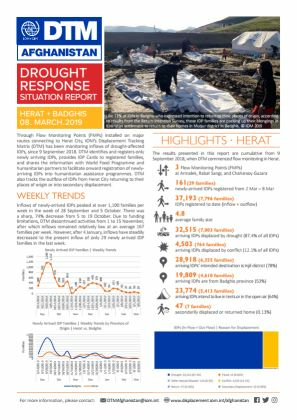 Through Flow Monitoring Points (FMPs) installed on major routes connecting to Herat City, IOM’s Displacement Tracking Matrix (DTM) has been monitoring inflows of drought-affected IDPs, since 9 September 2018. 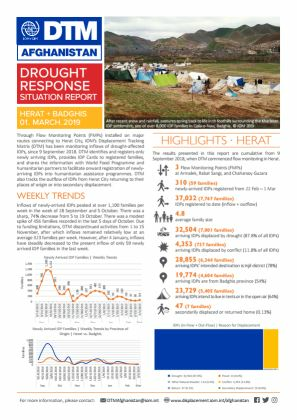 DTM identifies and registers only newly arriving IDPs, provides IDP Cards to registered families, and shares the information with World Food Programme and humanitarian partners to facilitate onward registration of newlyarriving IDPs into humanitarian assistance programmes. 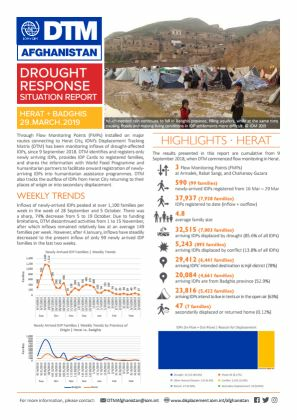 DTM also tracks the outflow of IDPs from Herat City returning to their places of origin or into secondary displacement. 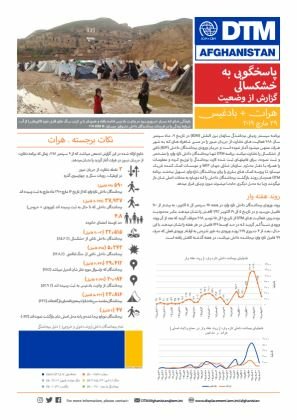 Inflows of newly-arrived IDPs peaked at over 1,100 families per week in the week of 28 September and 5 October. There was a sharp, 74% decrease from 5 to 19 October. There was a modest spike of 456 families recorded in the last 5 days of October. Due to funding limitations, DTM discontinued activities from 1 to 15 November, after which inflows remained relatively low at an average 323 families per week. 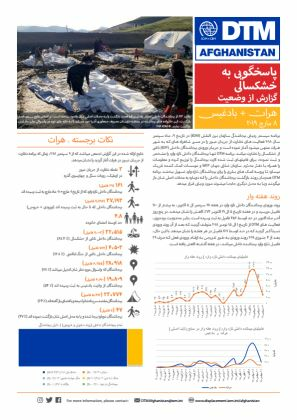 However, after 4 January, inflows have steadily decreased to the present inflow of only 59 newly arrived IDP families in the last week.